The original plan was to taste-test Spam and various Spam “luncheon meat” knockoffs. Didn’t happen, couldn’t do it. Even I have my limits (really!). I’m not excited to eat any Spam, much less sample a bunch of secondary brands. But a bunch of secondary brands exist, and I’m about to marvel at them, even if I don’t taste them. First, a bit of context. Spam can mean many things these days, but here we are talking about the food, or “food” — canned precooked meat product, if you prefer. I used to think of Spam as a WWII cheap-GI-food product, and I guess it was, but it was invented pre-war in 1937 and really popularized afterward, especially in the South Pacific during U.S. occupation of various far-flung lands and islands. More at the useful Wikipedia entry for Spam, which in this case I think is probably reliable enough. Spam tastes okay, I guess, if you like that kind of thing, and it should: a 3.5 ounce serving contains nearly half of the average human’s daily allotment of saturated fat, and nearly two-thirds of sodium. The pasty-meat-byproduct texture is what stops me in my tracks, and also the aspic in which it is packed — reminds me of that time in 6th grade playing D&D when we were attacked by a gelatinous cube. Also I have to force myself not to think of the provenance of the various ingredients, especially the (allegedly) chopped pork shoulder meat. But if the aspic is thoroughly wiped away and a slice of Spam is pan-fried, with a nice crisp crust forming on the outside, then maybe I could be convinced to eat it. Or maybe if someone competent made me some musubi. Especially if they flew me to Hawaii first. I will consume Spam in exchange for a Hawaii trip! Everybody has to draw a line in the sand sometime, and my Spam line is drawn in the hot white sands of the Hawaiian Islands. Anyway, it continues to be popular, particularly in Asia, and a bunch of knockoffs are available, mostly choosing to call the product “luncheon meat” instead of “spiced ham” — you can still have your luncheon meat for breakfast or dinner, if you want. Thanks to H Mart, many knockoffs are available right here in Wheaton, plus multiple flavors of actual Spam: Oven Roasted Turkey, Real Hormel Bacon, Black Pepper, Lite, 25% Less Sodium…so many choices of Spam. Who knew? 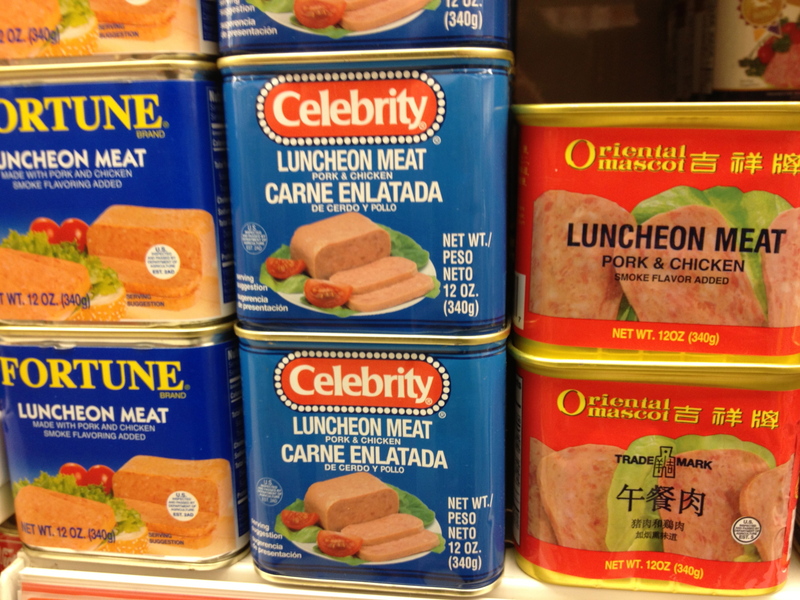 But if one wanted to branch out, one could also try the generic luncheon meat offerings from such charming brands as Ligo, Fortune, Celebrity, Roxy, or Oriental Mascot. H Mart carries them all — seeing all the brands together on the shelf is what sparked this post. I am having trouble understanding how the demand for off-brand canned precooked meat product could be so high that all these brands exist together. It is possible these same cans have been sitting on the H Mart shelf for years, unpurchased, but I doubt it. I think someone is buying them, and possibly eating them too. What else could you do with Spam? Could you build a house out of it? It may have good insulating properties, and probably a longer shelf life than vinyl siding. I’m just speculating here. I’ve been struggling to come up with anything clever* to say about Woodberry Kitchen, one of Baltimore’s newer hot restaurants. “Newer” in my addled mind, at least – it opened in 2007 and so is hardly new anymore. We finally went recently (but getting less recent by the day) and our high expectations turned out to be too high, but in ways I’m finding tough to express. * As this review will surely demonstrate. There is lots to admire about WK: in particular, the space, which is divided into several large, high-ceilinged rooms with lots of wood and brick. The restaurant is part of the revitalization of the old Clipper Mill site, ravaged by fire in 1995. The redevelopment has maintained the industrial feel, including the facade of the old foundry, and WK fits in beautifully, a sort of rustic elegance. The upstairs section above the bar looks cool. They also have a nicely appointed outdoor courtyard where, surprisingly, the acoustics are better than the fairly loud indoors, thanks to a wall of trees and shrubs blocking street noise. Service is also excellent if a little slow at times – they seemed to be a person short, maybe. But everyone is friendly, knowledgable, helpful, and (sometimes too) unobtrusive. 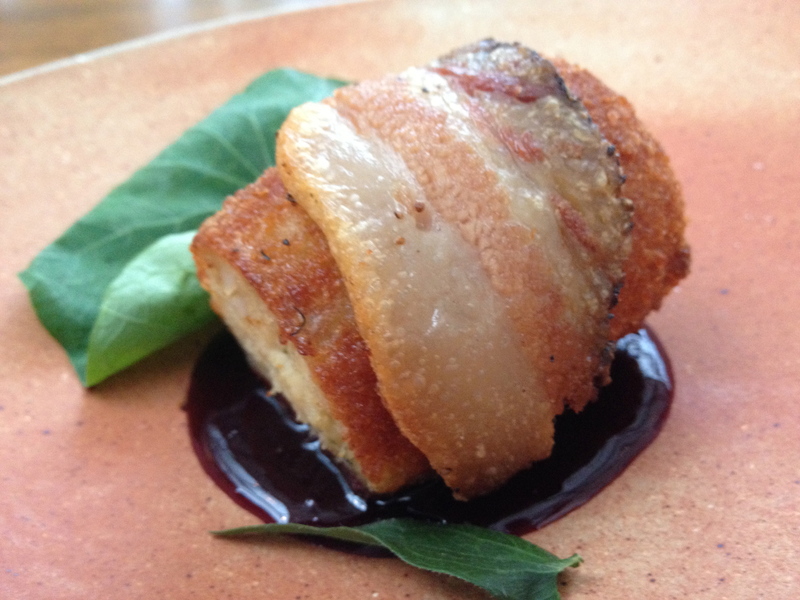 And the food was fine – good even, and we appreciated many small touches – but not great. 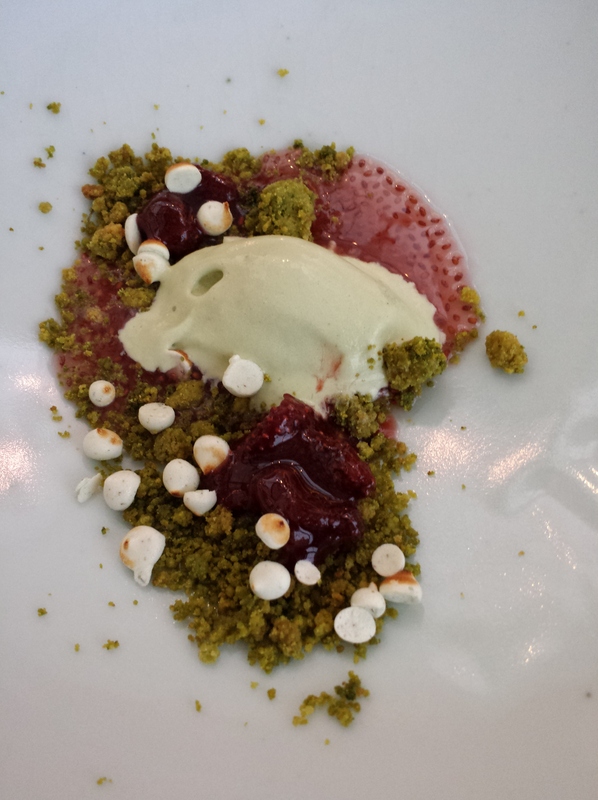 We had been expecting great, and maybe that was unfair, since really Woodberry Kitchen is a neighborhood bistro, it’s not trying to be Charleston or any kind of expense account restaurant. 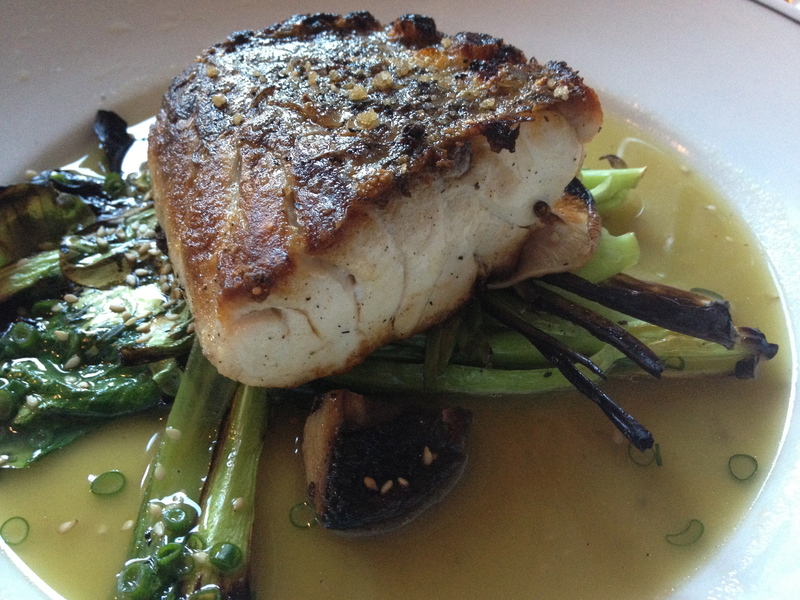 For example, blackened rockfish was served on a bed of fresh greens in a zesty pool of soy-based broth, and the exterior was nice and dark, but the fish itself lacked much flavor. Rigatoni was fine but not any different than you get at many neighborhood Italian joints. 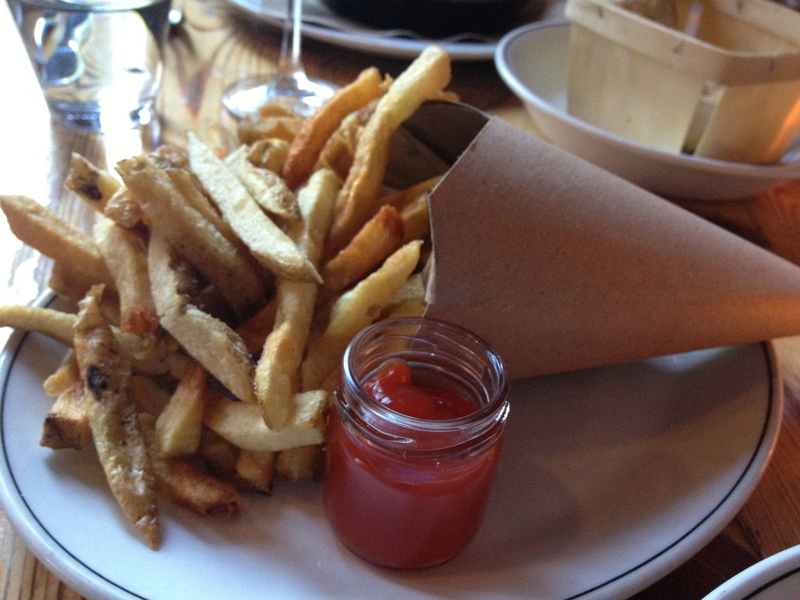 Thin crisp french fries served in a cute paper cone had good potato flavor and would have been great if they had been served above room temperature (we did also like the mini-mason jar of ketchup on the side). 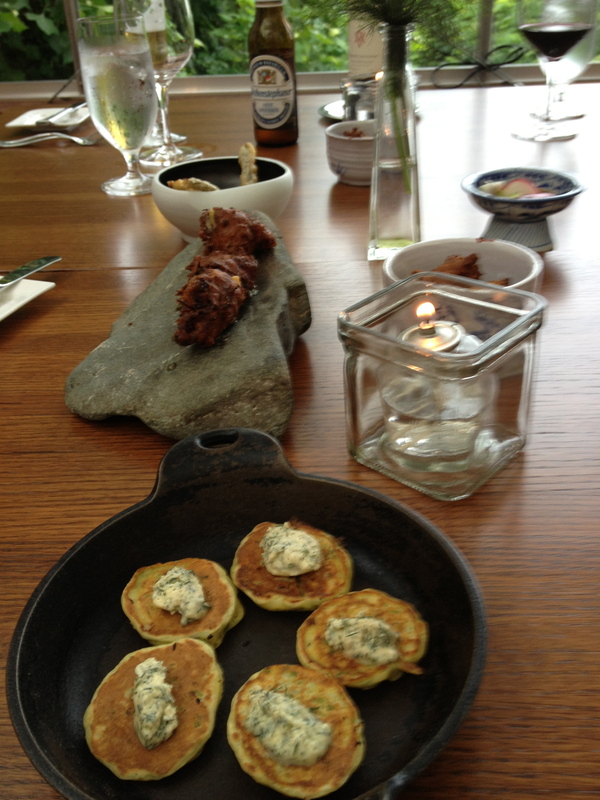 Sometimes the starters outshine the entrees, but for us it was more of the same. Popcorn could be a fun snack for starters, but as with the fish, it needed more seasoning. 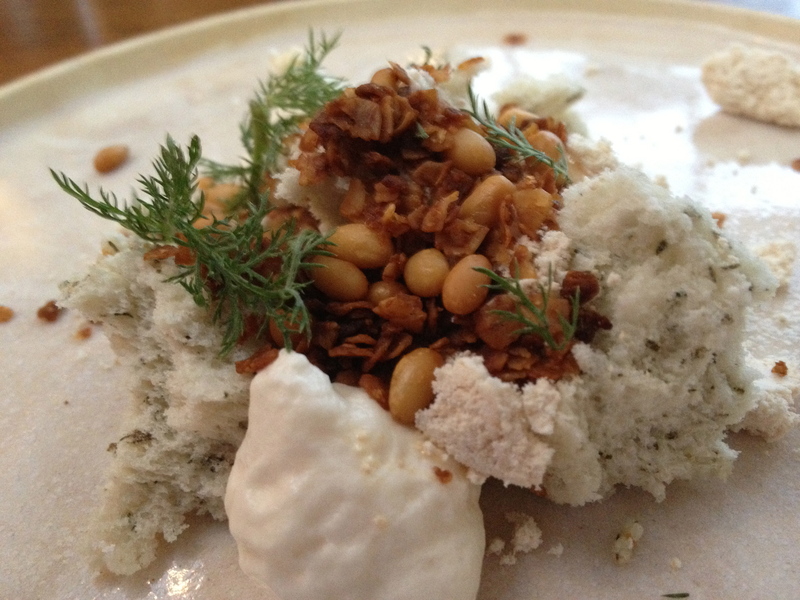 The “crab pot” – cheesy sherried crab dip — was, again, fine but not extraordinary, particularly once it started to congeal not long after arriving at the table. Are we sensing a theme? Woodberry Kitchen isn’t crazy expensive, but it isn’t cheap either, with most entrees in the $25-30 range. At those prices, in those surroundings, and given the local-celebrity chef Spike Gjerde hype, the food really should be more exciting. We do appreciate the local sourcing, farm-to-table thing, but that isn’t enough to overcome…not exactly lack of execution, just lack of excellence. Good, just not great. In the end we were glad we went, but I don’t think we would rush back. “Coming soon”: reviews of Range (great), Potowmack Farm (awesome), Woodberry Kitchen (finally), probably a few others I can still dredge out from the old notes. Also spam spam spam spam spam eggs and spam. Wheaton’s newest restaurant El Catrachito got a rave review in the Post a couple of weeks ago, although they manage to avoid using the term “Wheaton” (other than being the nearest Metro stop), instead locating it in Silver Spring, which is technically true but totally misleading. Anyway, I guess I need to try it — I like the Honduran aspect of it, something new around here. 2408 University, in the old Irene’s III hole in the wall just down from New Kam Fong. For me, July 4 is memories of cherry pie, potato salad, and croquet at my grandmother’s house in Tacoma. Those things all did happen, sometimes together, maybe not actually on July 4 but at other times in summer…whatever. Also fireworks over Lake Washington at Sheridan Beach, which clearly did not coincide with Tacoma-based activities. Mrs. Senior Me taught me how to make potato salad, when I was wee, and while I am always tweaking the recipe — because I am always tweaking all recipes, otherwise I get bored, plus I still haven’t quite achieved the Platonic ideal of potato salad — I still make it more or less the way she taught. Sometimes there is bacon, but not in the original, and not this year. 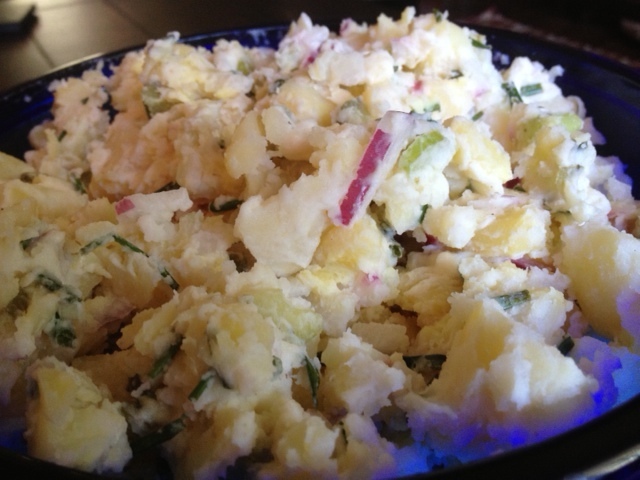 I have always loved potato salad, and even some people who don’t normally like potato salad like this (mayo-free) version. Thanks Mom! Happy 4th!